The great attraction of soaring in mountain waves stems from the continuous lift to great heights. Soaring flights to above 35,000 feet have frequently been made in mountain waves. Once a soaring pilot has reached the rising air of a mountain wave, he has every prospect of maintaining flight for several hours. While mountain wave soaring is related to ridge or hill soaring, the lift in a mountain wave is on a larger scale and is less transitory than lift over smaller rises in terrain. Figure 171 is a cross section of a typical mountain wave. FIGURE 171. Schematic cross section of a mountain wave. Best lift is upwind from each wave crest for about one-third the distance to the preceding wave crest. When strong winds blow across a mountain range, large “standing” waves occur downwind from the mountains and upward to the tropopause. The waves may develop singly; but more often, they occur as a series of waves downstream from the mountains. While the waves remain about stationary, strong winds are blowing through them. You may compare a mountain wave to a series of waves formed downstream from a submerged rocky ridge in a fast flowing creek or river. Air dips sharply immediately to the lee of a ridge, then rises and falls in a wave motion downstream. Marked stability in the airstream disturbed by the mountains. Rapidly building cumulus over the mountains visually marks the air unstable; convection, evidenced by the cumulus, tends to deter wave formation. Wind speed at the level of the summit should exceed a minimum which varies from 15 to 25 knots depending on the height of the range. Upper winds should increase or at least remain constant with height up to the tropopause. Wind direction should be within 30 degrees normal to the range. Lift diminishes as winds more nearly parallel the range. 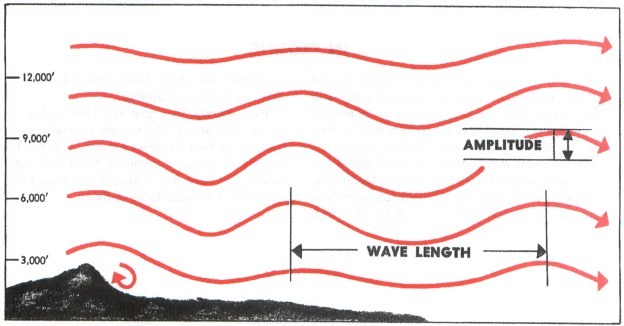 Wave length is the horizontal distance between crests of successive waves and is usually between 2 and 25 miles. In general, wave length is controlled by wind component perpendicular to the ridge and by stability of the upstream flow. Wave length is directly proportional to wind speed and inversely proportional to stability. Figure 172 illustrates wave length and also amplitude. FIGURE 172. Wave length and amplitude. Amplitude of a wave is the vertical dimension and is half the altitude difference between the wave trough and crest. In a typical wave, amplitude varies with height above the ground. 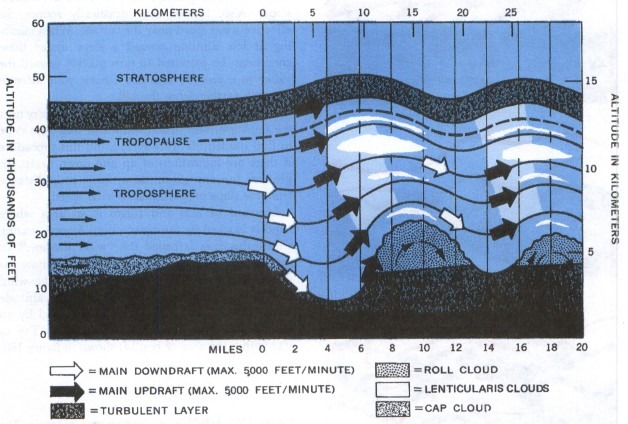 It is least near the surface and near the tropopause. Greatest amplitude is roughly 3,000 to 6,000 feet above the ridge crest. Wave amplitude is controlled by size and shape of the ridge as well as wind and stability. A shallow layer of great stability and moderate wind produces a greater wave amplitude than does a deep layer of moderate stability and strong winds. Also, the greater the amplitude, the shorter is the wave length. Waves offering the strongest and most consistent lift are those with great amplitude and short wave length. If the air has sufficient moisture, lenticular (lens-shaped) clouds mark wave crests. Cooling of air ascending toward the wave crest saturates the air forming clouds. Warming of air descending beyond the wave crest evaporates the cloud. Thus, by continuous condensation windward of the wave crest and evaporation leeward, the cloud appears stationary although wind may be blowing through the wave at 50 knots or more. Lenticular clouds in successive bands downstream from the mountain mark a series of wave crests. Spacing of lenticulars marks the wave length. Clearly identifiable lenticulars also suggest larger wave amplitude than clouds which barely exhibit lenticular form. These cloud types along with stratiform clouds on the windward slopes and along the mountain crest indicate the stability favorable to mountain wave soaring. Thunderstorms or rapidly building cumulus over mountains mark the air unstable. As they reach maturity, the thunderstorms often drift downwind across leeward valleys and plains. Strong convective currents in the unstable air deter wave formation. If you sight numerous instability clouds, wait until another day for mountain wave soaring. A mountain wave, in a manner similar to that in a thermal, means turbulence to powered aircraft, but to a slowly moving sailcraft, it produces lift and sink above the level of the mountain crest. But as air spills over the crest like a waterfall, it causes strong downdrafts. The violent overturning forms a series of “rotors” in the wind shadow of the mountain which are hazardous even to a sailplane (see ch. 9, figs. 81 through 84). Clouds resembling long bands of stratocumulus sometimes mark the area of overturning air. These “rotor clouds” appear to remain stationary, parallel the range, and stand a few miles leeward of the mountains. Turbulence is most frequent and most severe in the standing rotors just beneath the wave crests at or below mountain-top levels. This rotor turbulence is especially violent in waves generated by large mountains such as the Rockies. Rotor turbulence with lesser mountains is much less severe but is always present to some extent. The turbulence is greatest in well-developed waves. Mountain waves occur most frequently along the central and northern Rockies and the northern Appalachians. Occasionally, waves form to the lee of mountains in Arkansas, Oklahoma, and southwestern Texas. Weather satellites have observed waves extending great distances downwind from the Rocky Mountains; one series extended for nearly 700 miles. The more usual distance is 150 to 300 miles. While Appalachian waves are not as strong as those over the Rockies, they occur frequently; and satellites have observed them at an average of 115 miles downwind. Wave length of these waves averages about 10 nautical miles. You often can detect a wave by the uncanny smoothness of your climb. On first locating a wave, turn into the wind and attempt to climb directly over the spot where you first detected lift provided you can remain at an altitude above the level of the mountain crest. The lee side turbulent area is for the experienced pilot only. After cautiously climbing well up into the wave, attempt to determine dimensions of the zone of lift. If the wave is over rugged terrain, it may be impossible and unnecessary to determine the wave length. Lift over such terrain is likely to be in patchy bands. Over more even terrain, the wave length may be easy to determine and use in planning the next stage of flight. Wave clouds are a visual clue in your search for lift. The wave-like shape of lenticulars is usually more obvious from above than from below. Lift should prevail from the crest of the lenticulars upwind about one-third the wave length. When your course takes you across the waves, climb on the windward side of the wave and fly as quickly as possible to the windward side of the next wave. Wave lift of 300 to 1,200 feet per minute is not uncommon. Soaring pilots have encountered vertical currents exceeding 3,000 feet per minute, the strongest ever reported being 8,000 feet per minute.